When company comes over, you have to clean in a hurry. The problem is, you have to find a spot for all your excess clutter. If you are like many Americans, that room of woe is the garage. It might be so full that you cannot fit yourself in it, much less one or two cars. But, there is hope. By using your garage as a room for storage and not a room for chaos, you can eliminate clutter and never again lose your mind looking for the screwdriver. Once you have some idea of the quantity and volume of items you want to keep in your garage, you will be able to see what shelving and cabinets you will need. Now that your items are generally sorted, you should think about how you want to organize them. Putting all lighting-related bulbs and equipment together makes sense, until you realize that you will never need to access the summer lanterns and the Christmas lights at the same time. As such, you may organize your storage bins and shelving by season. Take this opportunity to consider how to best use your garage as a useful addition to your home, and arrange things to be accessible if you need them more readily. Your items have been sorted and consolidated, and you think you know where you will put them. 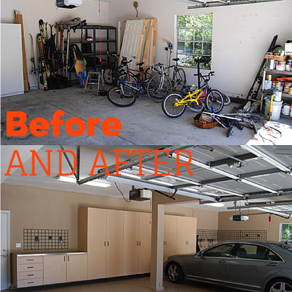 Now, you can start to create the garage organization storage system that is ideal for your needs. Remember that, although a complete garage redo usually costs well over $1,000, there are several options at almost all price points. Remember that garage cabinets and shelving are useful, but too much can make your garage seem more crowded. Leave some space on the wall for large equipment and for more open space. The most wasted opportunity in garage storage lies in the ceiling. Do you have anything up there? If not, take that chance. Install ceiling hooks to hang bikes, skis and sports equipment. Slatted walls make it easy to store larger equipment that defies the cabinet or shelf, without forcing you to put them on the floor. Clutter in the home reflects your state of mind. And the more organized your life is, the happier you are. Take the time to sort and consolidate your clutter, and maximize the space in your garage with custom cabinets and ceiling storage. That way, your path to your tools, decorations and equipment is a simple task.